La Sirène is a luxury camping site that is surrounded by intense natural beauty. La Sirène is a luxury camping site that is surrounded by intense natural beauty. 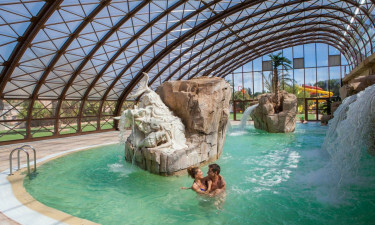 This prominent LUX-camp is conveniently located in the heart of the town of Saint Jean de Monts in the Pays de Loire region of France and guests will find a gorgeous sandy beach right on their doorstep. With all this and much more for guests to enjoy, La Sirène provides everything that lovers of luxury camping could possibly need. What Makes La Sirène So Special? Guests are sure to love following the pine tree lined winding lane to the spectacular sand dunes of the sandy beach that is just a short walk away from La Sirène. The beach is situated less than half a mile from the luxury camping site and spending time on the sand and taking a dip in the cool clear water here is a real pleasure. Explorers won’t be disappointed here, either, as there are some pretty hiking trails to discover, just running alongside the beach. Looking for a sporty break? Then just work up a sweat on the volleyball court, or consider playing table tennis - an activity that the whole family can enjoy together on their camping holiday here. 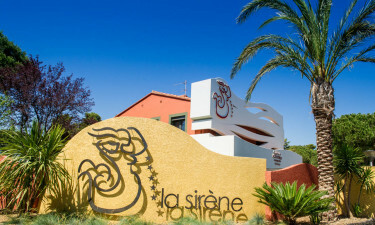 La Sirène also comes complete with a large outdoor swimming pool, which is surrounded with sun loungers for those who want to spend their time soaking up the sun. La Sirène occupies a perfect location for visitors who really want to get to know the impressive Pays de Loire region of France. Following the coastal road will lead visitors to a large number of scenic spots and there are plenty of places to pause here while soaking up the scenery. This part of France is also famous for its rich history and most of the local towns and villages have interesting and informative museums and well as plenty of other attractions. The onsite restaurant is a great place to enjoy a traditional French meal along with a glass or two of wine, while the site also features a snack bar. 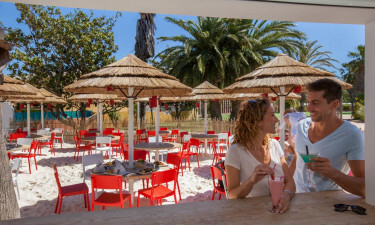 People who want to go out for a night on the town will find a good range of bars and clubs in the vibrant town of Saint Jean de Monts, which can be reached in less than twenty minutes on foot from the campsite. A good selection of shops are situated just a short stroll from the mobile home accommodation provided onsite and guests will find everything from grocery shops to souvenir shops here. A local market also sets up in the town twice a week and this is the perfect place to sample fresh local produce such as cheese and bread and purchase products to enjoy later.